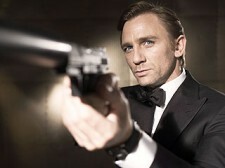 “Skyfall,” the 23rd installment of the James Bond franchise, begins shooting today in London. Other locations will include Scotland, Istanbul, and Shanghai. Javier Bardem will play the villain, and Judi Dench will return as M. Now that you know these things, you can go back to sleep. What Star Won’t End Up in “Nine”? Day-Lewis To Star In “Nine”?